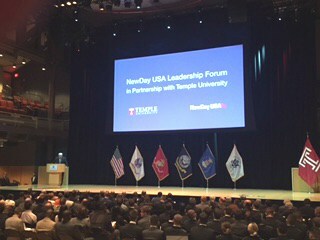 Last week, Pango Financial President Candice Caruso attended the NewDay USA Leadership Forum at Temple University as a guest of a Temple staff member. 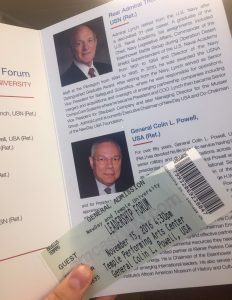 Hosted by NewDay USA, a veterans-focused mortgage provider and its Executive Chairman Rear Admiral Tom Lynch, USN (retired) in partnership with Temple University, the forum featured former Secretary of State and retired U.S. Army General Colin Powell. Powell was on hand to speak at the forum and to celebrate the grand opening of the Temple University Military and Veteran Services Center. Powell wove a story of his upbringing in New York City as the son of two immigrants. Living in a segregated world, Powell joined the military and found success in the meritocratic structure. His time in politics helped him develop a sense of his own value within a much larger system, as both a servant and as a leader. Powell described a theme of inspiration leadership throughout his talk. Inspirational leaders have vision and can lead their teams through tough and risky situations without compromising their mission. But importantly, Powell says inspirational leaders create inclusion and appreciation. They empower their team to be part of the process. They show their appreciation through genuine kindness and interest in the people who work with them and for them. He described a time during his tenure as Secretary of State when, while bored in his office, he left to go socialize with the mostly immigrant valet drivers who served the White House and Congress. Powell said that while he recognized he was a leader, he was also an equal. During this post-election time of political and economy uncertainty, Powell’s greatest lesson for attendees at the Leadership Forum was that inspirational, transformational leadership is critical. This advice resonated with the audience of the military-focused event. Strong, decisive leadership in times of stress are a fact of life for service members and veterans, which is exactly why they make for successful business leaders. At Pango Financial, we recognize this fact, which is why we publish our Vetrepreneur Funding Guide and have special offers for veterans on our DreamSpark Plan.